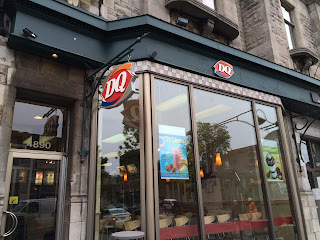 I’ve been invested in poutine from Dairy Queen and I walked to one of the decent sized branches the other day. 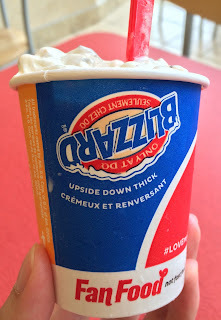 However, the branch didn’t have poutine so that I only got a new Blizzard which is new and collaborated with “Jurassic World” launched on May 26, 2015. 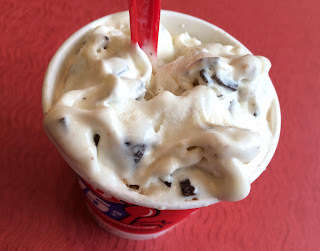 The new favor was advertised as “Jurassic Smash Blizzard” and it’s a smashed up peanut butter cookies and cookie dough comes in a Jurassic World cup. I was so hungry that I just got it in a regular cup, because I had no choice. 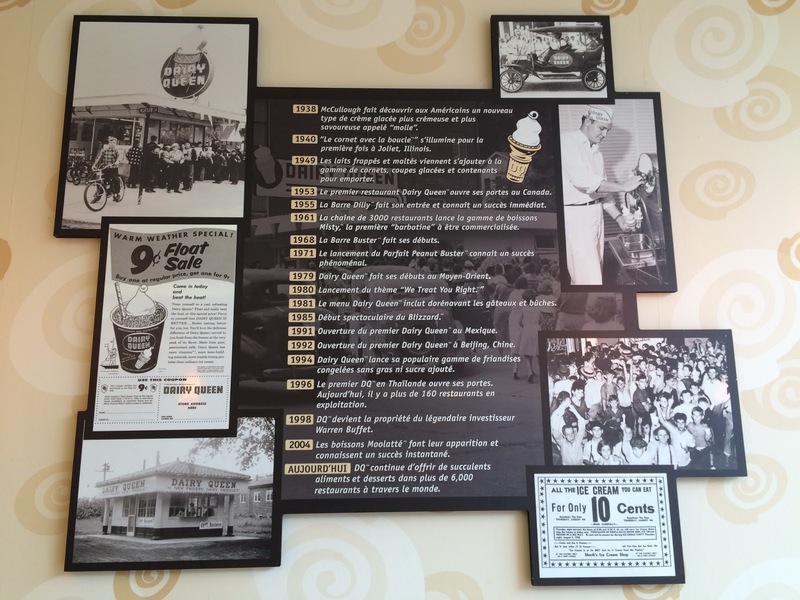 Regarding Dairy Queen, it’s a chain of soft-serve and fast food restaurants opened for business on June 22, 1940 in Illinois. About Blizzard, it’s a soft-serve blended with mix-ins like cookies, brownies, or candies. It’s launched in 1985, and that year Dairy Queen sold more than 100 million Blizzards. On July 26, 2010, they introduced a “Mini” which is 6 oz. There’re 4 sizes (Mini - 6 oz, Small - 12 oz., Medium - 16 oz. and Large - 21 oz. 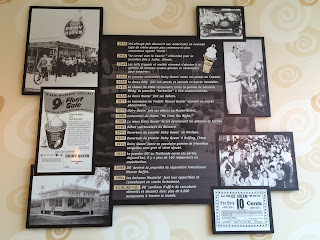 ), and I chose “Petit" which is Mini but as it's in Montreal, everything was in French. After mixing it up, he flipped the cup upside down to see if the ice cream was thick enough to stay in the cup. I did it the same on my own, and yes, it stayed as it was. 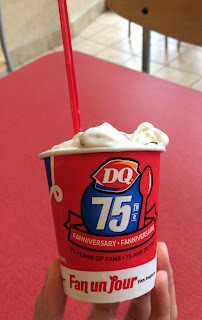 It's 75th anniversary of Blizzard. The vanilla ice cream was smooth without any icy and rocky texture, and though it’s refreshing, the vanilla flavor was dense. 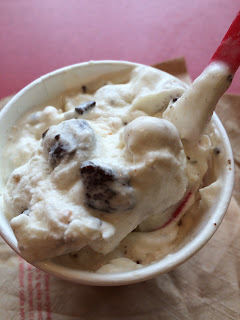 And there’re lots of crispy cookies, sticky dough and chunky chocolate pieces, and every time I scooped some ice cream, the ratio of the ice cream and the chunks was about 1:1 in the spoon. Peanut butter added saltiness besides sweetness and choco chunks were a little bit bitter, and those chunks were full filing so that for me, the petit size was more than enough for me. 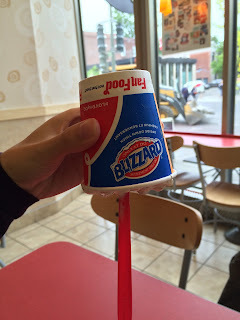 Overall, I couldn't eat the poutine nor get the Jurassic World cup, and it's quite sad.